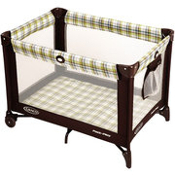 Our pack-n-play is perfect for sleeping, playing or going to the beach. The mesh sides make for easy viewing. Includes padded floor and sheet. Colors and styles may vary. Measures 38" x 27"